Fabco-Air manufactures parts for a wide variety of industries including high-performance race cars. A recent upgrade to new turn/mill centers has helped the company reduce its set-up time and often eliminate it altogether. Scot LaMar is not only a 40 year machining veteran and Vice President of Fabco-Air, he is also a racing enthusiast. Well, not just an enthusiast, Lamar owns and races four cars. "I've been racing since 1963. My dad was tech director for Nascar drag racing in 1965 and 1966. 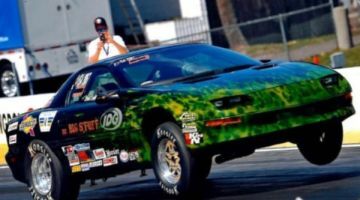 Drag racing has been a part of me since then," affirms LaMar. Fabco-Air supplies components for race cars like Scot LaMar's '95 Camaro. As a manufacturer of high quality pneumatic automation components, Fabco-Air was recently searching for a solution to increase its productivity without compromising its flexibility. "As a supplier of pneumatic components to numerous racing product manufacturers, we needed a machining solution that would improve throughput of hundreds of parts run in production and still handle the odd- ball parts needed for the small lot runs," adds LaMar. Eurotech's turn/mill center features over 80 cutting tools on a single turret. After much research, Fabco-Air found the answer to its problem at Eurotech Elite -- Eurotech's turn/mill center with Y axis and two spindles with C axis, the B545 SLY. Fabco's decision was based not only on the technology that Eurotech provided but also the engineering support team. 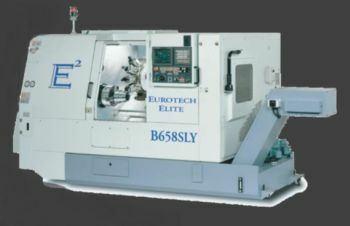 Shortly after, a second machine was purchased -- Eurotech's B835 SLY. Bill Schmidt, President of Fabco-Air, quickly learned how to utilize the full potential of the machine: "Parts went from 7 ops to 1 op., set-up time was greatly reduced and often eliminated altogether. With Eurotech's B545 SL-Y, we not only reduced our operations, but we inspect a complete part one time instead of a partial part seven times. 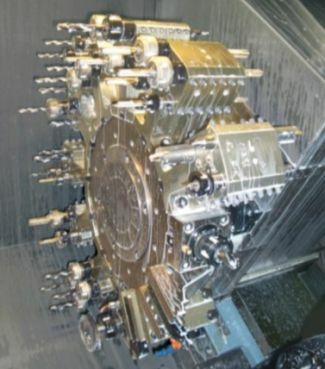 We have over EIGHTY cutting tools on a single turret and run numerous parts with one program by simply calling up a macro for over 200 different parts. In fact we only use 10 stations for the large variety of parts and leave two stations open for odd ball parts." Fabco-Air manufactures parts for a wide variety of industries including medical, semi-conductor, and automotive. Fabco-Air now owns six Eurotech Elite machines: three of the single turret, six-axis series; and two of the universal chuck & bar turn/mill centers that boast a 35 hp integral spindle with 4.02" bar capacity, double wound motor, 26" turning length and dual spindle -- the B658SLY. About 45 percent of Fabco-Air's business is special products designed to customer specifications, and the engineering staff is ready to assist customers in custom designs and any technical aspect of their business. They also have full CAD support, available in 2D or 3D. Their extensive and diverse product line has allowed them to become a major provider to the most demanding industries including medical and robotics, as well as automotive and custom motor vehicles. Eurotech's turn/mill center with Y axis and two spindles with C axis. Fabco-Air upgraded to the new machines in part because management felt they had a reputation to uphold and an international cliental that demanded they stay up with the cutting edge of technology. According to Schmidt, "Eurotech allowed us to continue with our diverse and rapidly growing product line, while offering on-time delivery and excellent quality control. We achieved a reduction of throughput time, a shorter handling time and a huge reduction of set-up time". "Eurotech has gone above and beyond the call of duty. We are extremely pleased with the Eurotech product and team."